The December General Meeting of the Northern California Translators Association hosted polyglot author, language educator, and world traveler, Susanna Zaraysky. Susanna gave a harmonious presentation on Language is Music that had her audience reminiscing of childhood lullabies and commercial jingles. Ms. Zaraysky speaks seven languages, is the author of two books, Language is Music and Travel Happy, Budget Low, and is the host of a Spanish-language segment, El idioma es música on the morning show Al Despertar on Univision San Francisco. 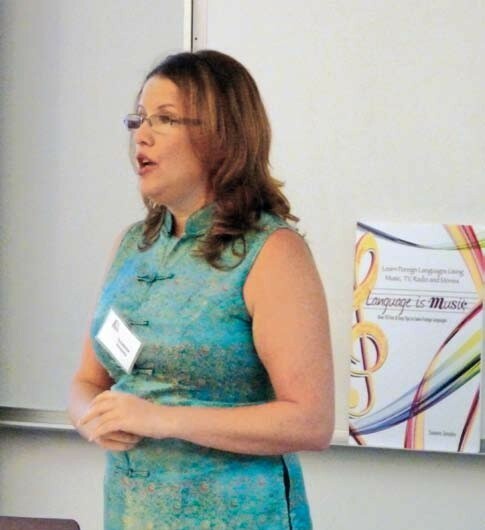 Susanna’s language theory focuses on learning a new language through tunes, melodies, and simply listening to native speakers before intellectually attempting to learn the language’s vocabulary and grammar. After reading the book Musicophilia: Tales of Music and the Brain by Oliver W. Sacks, Susanna applied the Keep It Simple model to foreign language learning. First, listen. Next, listen and watch. Lastly, practice. » Stick to a beat and genre of music you already enjoy. » Write down the lyrics as you listen. » Imagine the lyrics in your head. » Practice passive listening by listening to the radio in the background while multitasking. » Create a relaxed environment. » Record yourself singing and play it back. » Watch TV programs in the new language, record and write out the script. » Use the Internet to watch news sources in the new language. » Watch foreign films without subtitles or dubbing. » Pay attention to body language, which communicates cultural nuances. Practice with native language speakers. » Speak with others in the target language. Incorporate the new language into your daily routine. » Organize appointments and dates on a calendar. » Label items with sticky notes. Follow polyglot author and language educator Susanna Zaraysky as she blogs about language, literature, learning resources, and travel at Create Your World Books. Autoridad Nasionala del Ladino, a national organization with the goal of preserving and safeguarding Judeo-Spanish–also known as Ladino–can be found here. Endangered Languages, an online collaborative effort to protect global linguistic diversity, can be found here. Livemocha, a language community where you can learn a language and connect with native speakers for instructive help, can be found here. kim posted this article under Continuing Ed. on Saturday, June 1st, 2013 at 12:04 pm	You can follow any responses to this entry through the RSS 2.0 feed. Both comments and pings are currently closed.